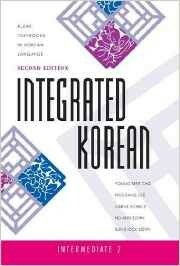 Produktinformationen "Integrated Korean: Intermediate 2 Textbook (Second Edition)"
This is a thoroughly revised edition of Integrated Korean: Intermediate 2 , the fourth volume of the best-selling series developed collaboratively by leading classroom teachers and linguists of Korean. All the series' volumes have been developed in accordance with performance-based principles and methodology--contextualization, learner-centeredness, use of authentic materials, usage-orientedness, balance between skill getting and skill using, and integration of speaking, listening, reading, writing, and culture. Grammar points are systematically introduced in simple but adequate explanations and abundant examples and exercises. Each situation/topic-based lesson of the main texts consists of model dialogues, narration, new words and expressions, vocabulary notes, culture, grammar, usage, and English translation of dialogues. In response to comments from hundreds of students and instructors of the first edition, this new edition features a more attractive two-colour design with all new photos and drawings and additional exercises that focus on vocabulary and grammar. Lessons are now organised into two main sections, each containing a conversational text (with its own vocabulary list) and a reading passage. The accompanying workbook, newly written, provides students with extensive skill-using activities based on the skills learned in the main text. Integrated Korean is a project of the Korean Language Education and Research Center (KLEAR) with the support of the Korea Foundation. In addition to the five-level Integrated Korean textbooks and workbooks, volumes include Korean Composition , Korean Language in Culture and Society , Korean Reader for Chinese Characters , Readings in Modern Korean Literature , Selected Readings in Korean , and A Resource for Korean Grammar Instruction . Weiterführende Links zu "Integrated Korean: Intermediate 2 Textbook (Second Edition)"
Unser Kommentar zu "Integrated Korean: Intermediate 2 Textbook (Second Edition)"
Kundenbewertungen für "Integrated Korean: Intermediate 2 Textbook (Second Edition)"